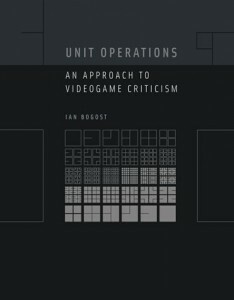 I title this article after a chapter in Unit Operations, written by Ian Bogost, and this notion particularly as it relates to games. For a long time, the academic community, and communities in general have evinced the notion that when one plays a game, one is meant to have fun. This is problematic for a number of reasons, not the least of which relates to the fact that fun is, like so many other activities, something the activity of playing a game can elicit, but need not be the focus of all games. Indeed, if games are to be appreciated as a medium, they must be something beyond just fun. They must, in fact, be able to evoke some fundamental quality that is vital to our being. It cannot simply be that they are for our enjoyment, in the same manner that The Count of Monte Cristo is not just about one man’s revenge. Games are, like any other media, able to produce a wide variety of emotions, lessons, eliciting relationships and bonds, as well as arguments and approbations. Games function as a media that is fundamentally about the self, and finding ways to creatively interact with systems, whether in an overarcing sense or on an individual level. Games contain play, which may be dated back perhaps to the earliest forms of theater and pantomime, relating specifically to our ability to reach into a structured ether and form personalities, to project and inject character into a world. The game is the art of giving life to the world through character, whether the world itself is what projects character, or whether the characters within state and restate their claims on that structured world. In effect, we are painting, with varying strokes, on a canvas sized on many different levels. While that may sound rather haughty, I believe it to be an accurate description of what games, and videogames will someday become. Re-representations of ourselves in a virtual, haptic world. Games are one of the few things which have a deeply storied history (other than religion, art, and politics), though the reasoning for this is likely because in games, we are able to project so many of these features, we are able to create a cultural memory that stays with us. The cultural memory of the interactive experience is something invaluable to us as human beings, and likely something required for us to survive. Children use games to make friends, to solve disputes, but perhaps more importantly they use games as a way of cultural communication. The games are a manner in which we communicate on a level deeper than fun, one more fundamental to our own well-being. That interactive experience is a ritual of bonding, allowing for individual spontanaeity and culturality to spring forth, informing others and enriching them in the process. What’s more, a game itself can be used as an expressive device to encourage development, and that fostering of the individual in the group is truly something games can take pride in. Games with rules make us better at analyzing systems. Games with few rules make us better explorers. Games with no (or almost no) rules make us creators. Each of these games supports a way in which, while playing games, we are researching limits. Perhaps that is the best way of describing what games truly are. An analysis of limits, and, if made in the right way, an unforgettable interactive experience. Like books, or movies, or any other genre, there is certainly a great deal of accounting for taste, but many see commonalities between games made intently as fun games, games that are not fun, and games that are something more. While there are currently many that fit into the first and second category, it’s fairly clear that the third is underexplored. It is not to say that these games do not exist, anyone who has played Flower or Demon’s Souls, much less Limbo or Journey, can tell you otherwise. Even older games (relatively speaking, videogames are a young medium), such as Another World, Grim Fandango, LSD, Silent Hill 2 or Rez (this list of games is by no means exhaustive), sought to explore where games might go, and yet games never really wandered from the path of trying to be fun. Which is a shame, because there’s an entire world of oddities untouched, as if somehow we are fearful of that aspect of the media, as if it’s mysterious. And perhaps it is, as so few games evoke that sense of mystery. What Would Molydeux? NYC game jam @ Parsons!